See the latest beachfront condos for sale from Clearwater Beach to St Pete Beach and all the Pinellas County Florida beaches in between. Not sure which area is right for you? See suggestions by a local expert below the current listings. Interested in a Beachfront Condo? If you have always wanted to live at the beach, what does that look like to you? Do you like being around all the different visitors to the area and their families? You love watching all the people on the beach with a sea of umbrellas. Children playing in the surf and large family gatherings at the picnic tables. If this is your idea of the beach life, then you want to be in Clearwater Beach close to the Pier and upper Clearwater Beach. You can walk to at least 50 restaurants, bars and coffee shops. The nightlife is jumping and exciting. Lots of lights, people, and entertainment at the pier. If living at the beach with wide views of the Gulf and the Intracoastal from your high rise home. Not very many people on the beach. Very quiet and tranquil. Your condo has lots of amenities. This includes multiple pools, fitness center, and you can walk to a few restaurants for breakfast, lunch, and dinner. If you want the excitement of Clearwater Beach you are a short stroll or Jolly Trolley ride to the Pier and those restaurants. If this your idea of beach life, then you want to live on Sand Key. This oasis of high rises and a few boutique complexes are so welcoming and all you need is right at your door. If living at the beach is a little more soft-spoken and a low rise condo is more your speed. If you would like to be able to do weekly rentals to generate income when you are not here. 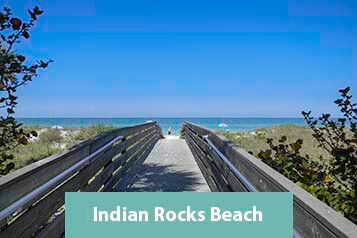 Then don’t forget about the areas of Belleair Beach, Indian Rocks Beach, Indian Shores, Redington and Madiera Beach. These areas have lots of condos to choose from that are Medium-Rise of 10 floors or less. Mom and Pop style condos are also available. Amenities are not that important to you. All you need is the beach and a pool and you are happy. These are the areas for you and your family. A lot of the areas are walking distance to great local restaurants and miniature golf. Nightlife is only a Jolly Trolly or Uber drive away. No parking hassles and lots of gorgeous sunsets and quiet to enjoy your family. Clearwater Beach is the best known, and northernmost beach of the Pinellas County Gulf Beaches. It has won awards for its sandy beaches and sparkling blue-green waters. It has the most activity, and the most restaurants and things to do. So if you are looking for lots of activities, and things to do it is a great choice. 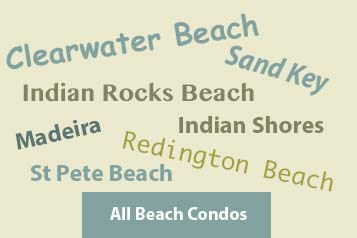 Below are some of the most popular beachfront condos on Clearwater Beach. 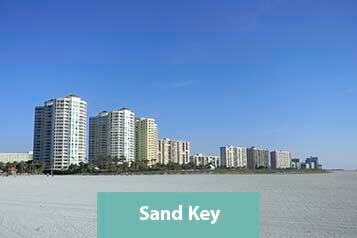 See all the beachfront condos on Clearwater Beach. Mandalay Beach Club - The Mandalay Beach Club is just north of Pier 60 and close to popular restaurants, bars, and lots of things to do. Sandpearl Residences - The Sandpearl is just north of Mandalay Beach Cub and next door to the popular Sandpearl Resort. It is one of the newest and most luxurious of the area's beachfront condos. Sand Key is just south of Clearwater Beach. This 3 mile stretch of beach is home to about twenty beachfront and waterfront condos. The beaches and streets are less crowded than Clearwater Beach, but you are just a short trip away from the action when you want it. Residents love the privacy and serenity of Sand Key. See all of the Sand Key Beachfront Condos. Ultimar - The three high-rise towers are home to Ultimar I, II, and III. Ultimar is one of the most popular condo communities on Sand Key. It offers great views, interesting layouts, and some of the most expansive amenities on the beaches. The Grande - This luxury beachfront property on the northern end of Sand Key just south of Sand Key Park. It offers lots of luxury and amenities and concierge services that allow you to easily enjoy all the area has to offer. Dans Island - Dans Island is the southernmost of the Sand Key beachfront condos. It has over 1,000 feet of beachfront shoreline. It has one of the highest owner-occupancy rates and a one-year minimum rental policy which helps create a strong community feel. These are just a few of your many options on Sand Key. Give us a call at 727-619-2799 to learn more, or check out all the Sand Key beachfront condos here. 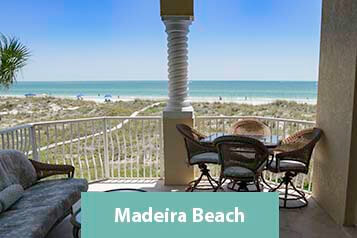 The middle beaches include Indian Rocks Beach, Indian Shores, the Redington Beaches, and Madeira Beach. 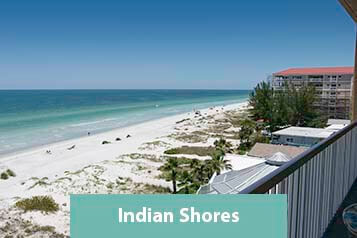 These beaches have more of an "Old Florida" feel with the condos part of the local community. There are fewer high-rise condos and more mid-rise and boutique condos here. Beach Cottage, Indian Shores - The courtyard feels like a tropical paradise has an amazing pool area with a huge deck where you can relax and enjoy the Gulf breezes. Tides Beach Club, Redington Beach - With 6 buildings and over 200 units, this is one of the largest and most popular beachfront condos on the middle beaches. The Tides offers full-on beachfront views, three pools and resort-style amenities including three beachfront pools, fitness center, conference center, entertainment area, television room, arcade center and billiard room. La Contessa, Redington Beach - La Contessa is a beautiful mid-rise building offering spacious three bedroom layouts with direct beach views. There is even a semi-private pier secured with your condo key. Redington Towers, Redington Beach - This large condo community offers moderately priced beachfront condos and lots of amenities like the Gulf-side pool, clubhouse, fitness center, sauna, and gated security. 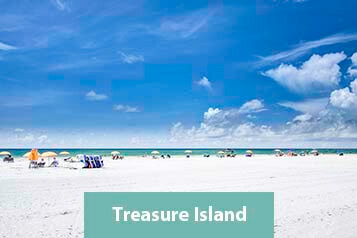 The lower beaches include Treasure Island and St Pete Beach. St Pete Beach is the southernmost of the barrier island beaches of Pinellas County. St Pete Beach officially changed its name from St Petersburg Beach to the shorter St Pete Beach in 1994 to more clearly distinguish itself from St Petersburg a few miles east on the mainland. Mansions by The Sea, Treasure Island - The 136 condo units are housed in two towers right on the Southern tip of Sunset Beach in Treasure Island. The community has a wide assortment of amenities including a sparkling pool, community room, fitness center, 2 spa’s, game room, library, tennis courts, shuffleboard, outdoor grills, and more. Lands End, Treasure Island - Lands End is on 14 acres of land on the southern tip of Treasure Island. It's a great location with the Gulf of Mexico to the west, and the Intracoastal Waterway to the east. There is even a dog beach shore of the Intracoastal!